functionality, quality and integrity. Skoda drivers are people who are unpretentious, down to earth and honest. The features, benefits and services that a customer will get from buying a new Skoda, will be its performance, looks, modernity, colour choice, design, engine and specification on one hand and its brand's name, image, quality, features such as twin airbags, electric windows front and rear etc., on the other hand, besides high levels of customer service and after-sales. Skoda’s core benefits include a high specification, matching rivals, complying with international standards of safety and emission. Components are supplied by top manufacturers such as Siemens, Bosch and Rockwell and specifications have been improved. The augmented product involves the quality of after-sales service, extended warranty conditions and credit. In fact, Skoda’s customer loyalty, i.e. repeat purchases, is second only to Mercedes. Using the Skoda brand name to launch a new product, through the strategy of brand extension, enabled Volkswagen to enter new market segments. Skoda’s product range is priced towards the lower end of the market, creating a fitment with the strategy of the Volkswagen Group. Skoda’s advertising campaign portrayed the positive changes, emphasizing on its partnership with Volkswagen. Previously, the stereotype of a Skoda owner was predominantly male and retired. Recent changes in brand image and positioning have attracted affluent retired people, independent working women, non-working women and younger family men, leading to large increases in sales world-wide. a. “A car brand is more than just a marque” Evaluate this statement and support with suitable justifications. so’irresistable’ deals, these prices are not just the only costs that the customer has to incur. The real cost of the service to the customer is an amalgamation of many inter-related monetary and non-monetary costs. Discuss the various search, purchase and post-purchase costs that you will have to incur in the purchase of the holiday package. 3. Nannytracker.com is the new kid on the block; a new mobile-app based service which helps you keep a tab on your children and their nanny while you’re out of the house. The Nannytracker, a new service for working parents, allows them the facility of home care viewing on their smartphones. The subscriber can view realtime video through a smartphone that is capable of showing video clips of footage of the home’s interior space. The app gives the user a comprehensive view of what their kids are up to while they are away. Besides the clandestine video clips of the home, that get captured periodically through a hidden camera and are posted to the parents, the smartphone app can be installed at both the parents and nanny’s end, and can work as a vital communication tool between them. The app provides easy messaging between parents, nannies, or any other caretaker, all within the account. Hence, any important information such as medication dosages, nappy changing frequency, food and play instructions don’t get missed out. The app also allows the Nanny to click pictures of the baby and post them so that they remain in one location/ account. The Daily News Feed provides an overview of their activities, as well as all the data that was tracked, messages that were exchanged, and photos that were shared. 2. Nestle wanted to understand the key challenges that their brand Maggi is likely to face in its comeback; in the wake of more aggressive competition from competitors such as Sunfeast Yippee noodles and Patanjali Atta noodles. The research agency took this brief from Nestle and gave instructions to its team to find out the customer satisfaction with Maggi and its arch rivals. â&#x20AC;&#x153;Specifying the research objective in the most clear and precise form, is the most crucial step involved in the research processâ&#x20AC;?. Evaluate this statement in the light of this case and discuss how the steps involved in this research process (as proposed by the research agency) will turn out to be different from what Nestle expects as the research outcome. 3. Scene 1: Nivedita, an interviewer for a data collection agency, approached a couple at the mall seeming to be hailing from a rural background and asked the woman, if she would like to participate in a marketing research survey. The couple quickly walked away. A group of teenage girls overheard Nivedita and asked her if they could participate. They were from rural areas, and they would like to answer Nivedita's questions. Nivedita was ecstatic! She could fill a good portion of her sample with these helpful girls! Scene 2: Nivedita had a list of names and contact details of 100 women in Faisapur in U.P. She started with the top 5 names. In 4 out of 5 cases, the women either didnâ&#x20AC;&#x2122;t respond to her request or refused to participate. Only one woman took the survey. How will she reach out to these 100 shortlisted women in one week? It seemed to be a daunting task as of now. Nivedita was confused. The reason was simple: The "normal" rules for conducting a marketing research survey do not apply when the target sample is a Rural population. MCom.,MPhil.,PhD for his timely help in the assignments and projects and MBA subject coaching. You can call him on his mobile no. 09025810064 (whatsapp available) or mail him at palaniappanmail@gmail.com. He does help/guide for the below question. If urgent or any queryâ&#x20AC;&#x2122;s, Please feel free to call him on his mobile no. 9025810064 (whatsapp available) or do mail on palaniappanmail@gmail.com. 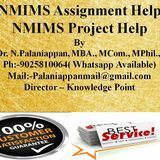 He does help/guide for the below question NMIMS Solved Assignment Solution June 2019 Sales Management 1. Mr. Sharma was a worried person because the sales graph for the last quarter was going down and this was due to the strong economic downturn, competition was stiff and payments for outstanding dues was not coming, the management meet was due and Mr. Sharma had no option to Motivate the sales staff to recover sales and payments. What in your opinion should be his motivational plan 2. Outline a plan for converting a prospect of Consumer Durable goods into a customer and the steps for closing the sales. 3. CASE STUDY - Godrej Godrej has taken a strong interest in the FMCG Sector and is trying to put large resources in the same. It has become a strong competitor to Hindustan Unilever and P&G. One of the main reasons for the growth is the large distribution network that Godrej has both in Urban and Rural Markets, the kiosks have been the mainstay of Godrej Network, it also has strong price points in the products offered. 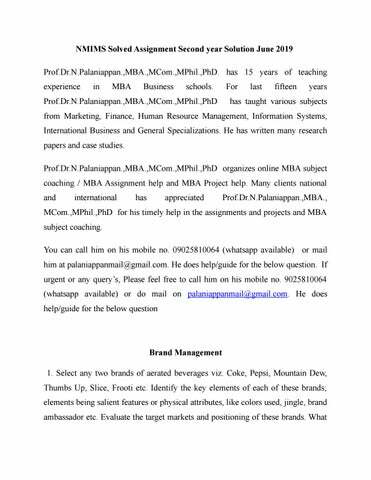 MCom.,MPhil.,PhD for his timely help in the assignments and projects and MBA subject coaching. You can call him on his mobile no. 09025810064 (whatsapp available) or mail him at palaniappanmail@gmail.com. He does help/guide for the below question. If urgent or any queryâ&#x20AC;&#x2122;s, Please feel free to call him on his mobile no. 9025810064 (whatsapp available) or do mail on palaniappanmail@gmail.com. He does help/guide for the below question NMIMS Solved Assignment Solution June 2019 International Logistics & Supply Chain Management 1. An old Indian company is in the field of animal nutrition for the past 25 years and is wanting to grow its business in line with the global sector growth and business opportunities. It is exploring the international opportunities and had want to enter in Kazakhstan and Russia the Eurasian countries due to high potential for the nutrition business. Derive a strategic plan for logistics, supply chain and a business plan to succeed and establishing a strong foreign brand 2. SG electronics is a German manufacturing and marketing company is into white goods mainly washing machines, refrigerators and sophisticated kitchen ware. What is the approach strategy that the company would employ for the successful launch of its products in the INDIAN market? Formulate a strategic logistics and SCM plan which makes the company a top brand in the Indian market which is crowded with international branks like LG, KENSTAR, BOSCH and SAMSUNG. 3. According to TarĂ­ and Sabater (2004), firms must develop both the hard and soft parts of TQM in order to succeed. While the hard elements are related to quality tools and techniques for continuous improvement, the soft side is associated with management concepts and principles such as team work, leadership, customer focus and culture (Fotopoulos and Psomas, 2009). In their study about quality management tools and techniques, TarĂ­ and Sabater (2004) analyzed about 30 commonly used tools and techniques such as benchmarking, brainstorming, design of experiments (DOE), failure mode and effect analysis (FMEA), flow charts, poka yoke, quality function deployment (QFD), quality improvement teams and statistical process control (SPC). Soft elements indirectly affect performance, because they create an environment that facilitates the implementation of hard elements (Rahman and Bullock, 2005).